For those of us living in temperate parts of the world, winter means our yards grind to a halt. Plants and trees stand bare. Butterflies and other insects are hibernating. Honeybees stay in their hives. Earthworms are buried deep underground. Squirrels, raccoons, and opossums stay in their nests for days if the weather’s cold enough. Even at our feeders, where birds still whoosh in, they jet away as quick as they can. Still, winter has its own special charm. It’s quiet and peaceful out there. And, who doesn’t appreciate the beauty of freshly fallen snow, where for days, nothing may mar its pristine surface but the skinny toe prints of birds eating beneath our feeders. That’s what we see, but if we were to travel under the snow, we’d find a surprise: under-snow tunnels called subnivian spaces, relatively cozy traffic lanes busy with animals moving along them. Snowflakes have air pockets in them which hold heat and provide roughly the same insulation value as wood chips or brick. Even when the surface temperature is subzero, below the snow, it’s almost always above freezing. Snow also reflects the sun’s heat, keeping it from melting too fast. 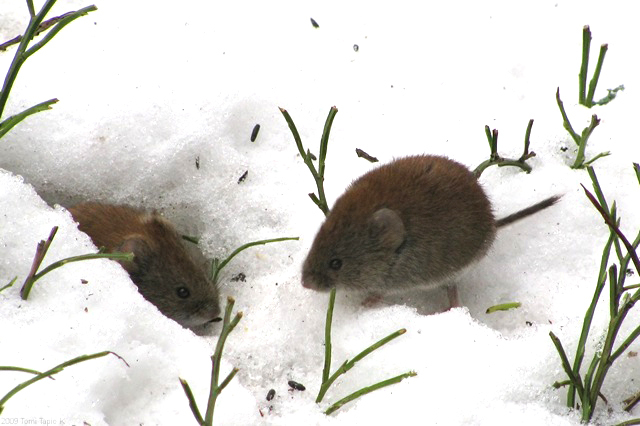 Mice and herbivorous voles dig mazes of tunnels through the snow to find the foods they like to eat. And there’s usually plenty to be found: Mosses, lichen, grasses, roots, and other plants are there, along with plant seeds and nuts. These industrious rodents dig chambers for food storage and resting places and punch small holes to the surface, probably to draw down fresh air. It’s likely that a little light from the sun also penetrates, giving them some visibility. Tiny carnivorous shrews use tunnels to look for mites, spiders, beetles, mice, and other voles. The subnivian world may almost be better than summer for these rodents — they can stay hidden from most predators. Not all, though. Foxes have such acute hearing, they can hear movement under the snow and will dive into it to grab a meal. Ruffed Grouse use the insulating properties of snow to keep them warm while they roost. 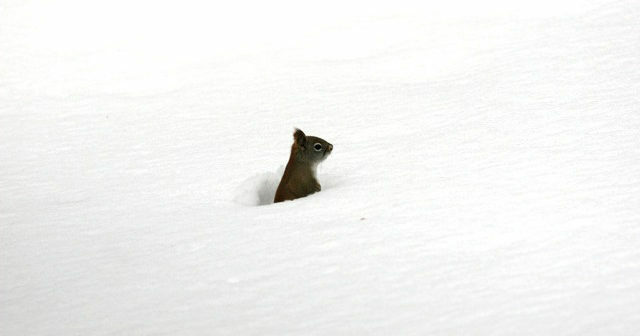 They dive into soft, deep snow and then dig down a bit farther to settle into it for the night. You might also be surprised to see insects and spiders on snow occasionally. They’ve wintered under leaf litter, now buried by the snow, and will sometimes rouse themselves and come to the surface to take advantage of warmer days. All this is going on, out of sight, in our snow-covered yards, so look for evidence — small holes at the surface. And as the weather warms and snow thins away, tunnels will become exposed. 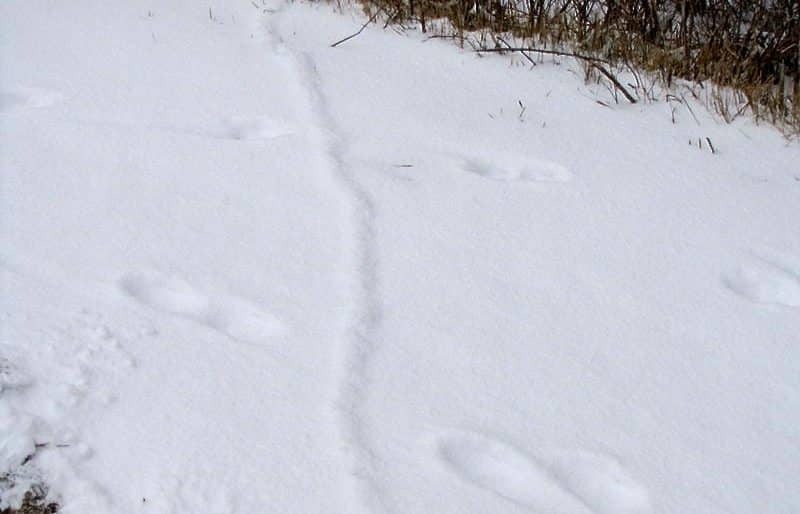 Summer wildlife disappear in winter, but where to?